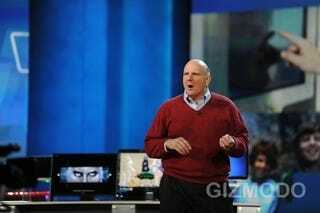 Two years on from taking over Old Billy Gates' role, and Steve Ballmer's not doing too badly. WP7 has got people excited, and Windows 7 is actually being used. Yet, he got half the usual bonus last year. According to Microsoft's annual proxy statement, Ballmer received "just" $670,000 in bonus for the last financial year. That's half what he could've earned in rewards, but that cash is nothing to sniff at, with the $670,000 effectively doubling his salary. The statement blames Ballmer for the "unsuccessful launch of the Kin phone, loss of market share in the company's mobile phone business, and the need for the company to pursue innovations to take advantage of new form factors."